Artisan Yuu from Thailand handcrafted this adorable sterling silver necklace. 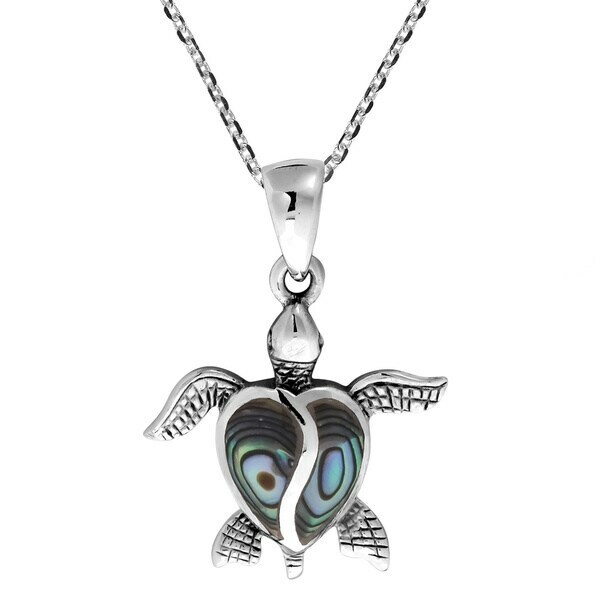 The pendant features the sea turtle with a heart shell stone inlay. The necklace includes an 18 inch long chain. In many cultures, the sea turtle symbolizes creation, strength, and good fortune. Add this accessory to your outfit and you'll never feel far from the ocean. All weights and measurements are approximate and may vary slightly from the listed information. Treatment code N (abalone) D (reconstructed turquoise). See Treatment Guide for further information. My sons girlfriend is going to love this. Once again overstock.com has exceeded my expectations. Necklace is very well made a beautiful! Overstock is a great place to do all your shopping! This pendant reminds me of my time in Florida and the very beautiful shells. It is just as described and just the bright addition to a "dress down" Sunday leisure day. This turtle is very cute. Nice and bright. Perfect size to just keep on all the time. Good quality. Just fun to wear. The necklace is more beautiful in person. I bought it for a graduation gift and she absolutely loved it! A Christmas gift for a friend who absolutely loved it! It's a beautiful piece, but only after a couple weeks there is discoloration.